I compiled Mark-Houwink parameters(WikiPedia) and make database. You can calculate Intrinsic Viscosity with this scheme. 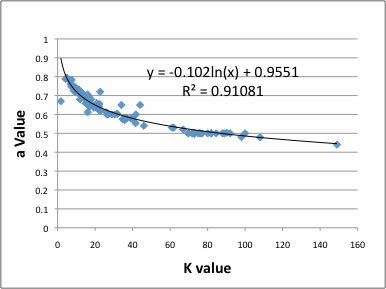 I compiled K and a values for many polymers with a lot of solvents. For solvents, a value of a = 0.5 is indicative of a theta solvent. A value of a = 0.8 is typical for good solvents. For most flexible polymers, 0.5< a <0.8. I studied this K and “a” value. Do you know the relationship of K and “a” value? 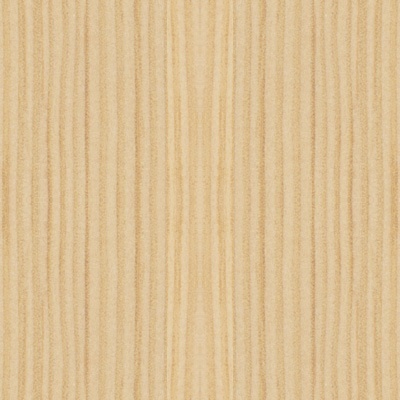 I show the example of PolyStyrene. I had 121 data point of K and “a” value of polystyrene with 33 kinds of solvent. There is very beautiful relationship like above chart. If you have “a” value, you can predict K value. This is not peculiar to polystyrene. Then how can we get “a” value for certain polymer with specific solvents? Temperature effect is not so large, but higher temperature make “a” value large. 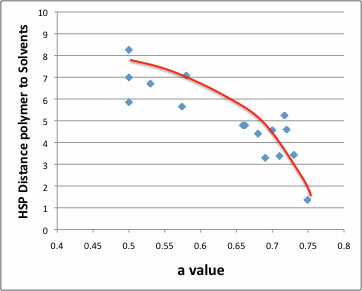 And the HSP distance from polystyrene to solvents have relationship of “a” value. Let's see the result in Hansen Space. Red small sphere mean the solvents that dissolve PSt good. Blue small spheres are poor solvents. Large sphere means PSt. The Green(R=8), Cyan(R=6), Yellow(R=4). The solvents located near center of PSt sphere, the viscosity become larger. 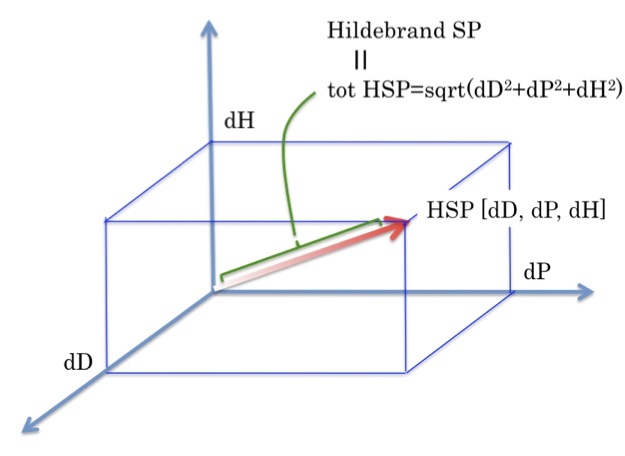 The theta solvent (“a” =0.5) HSP distance is long. And for this polystyrene, HSP Sphere radius is 8. And at Sphere radius 8, we think it will become theta solvent. 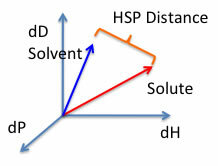 If the HSP distance become shorter than 8, the solvent become good solvents. According to become shorter distance, “a” value become larger. So, We can predict “a” value from HSP distance. From HSP distance, we can predict, “a” value. From “a” value, we can get K value. And we can get Intrinsic Viscosity for any molecular weight of polystyrene with every kinds of solvents and mixture solvewnts. HSPiP ver. 3.1.x, we have new sphere algorithm. With Quantitative Sphere algorithm, in ordinal case, you input real solubility data like g/100ml solvents. But you can enter this “a” value. In that case, program determine polymer HSP so as to get highest correlation “a” with HSP distance. I tried for polystyrene and get [18.1, 3.8, 4.0]. If you want to get “a” value from HSP of polymer, you’d better use this Quantitative Sphere function.